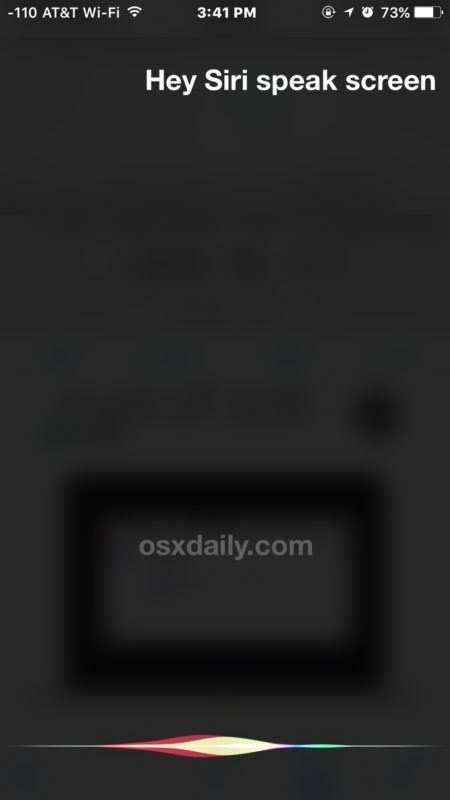 Siri has the ability to read anything on the screen of an iPhone or iPad to you. And yes, that means Siri will quite literally read aloud whatever is open and on the display of an iOS device, whether it’s a web page, an article, an email, a text message, anything on the screen will be read out loud by Siri, and you’ll even have controls for speeding up and slowing down speech, as well as pausing and skipping sections. To get the excellent Siri Speak Screen ability working on your iPad or iPhone, you will need to enable a little appreciated accessibility feature called speak screen, and then it’s just a matter of initiating the proper request with Siri. For a practical example of how this can work, let’s imagine you have found a great article on the web and you’d like it read to you aloud. All you need to do is load up the web page in Safari (or another browser of iOS) and then summon Siri and say “Speak Screen” and Siri will start reading the text of the article to you. Using the onscreen controls you can skip slow down Siri speech, skip backwards to a section to have it re-read, pause the speech, skip forward a section you don’t want read, or speed up the Siri voice reading. This trick pairs really well with either the iPad or iPhone if you have the volume turned up enough to hear the reading out of the built-in speakers, but it also works wonderfully with headphones or speakers. Using this trick you could have Siri read you an article, an email, a web page, anything on screen, while you commute, or are out and about, or even just laying around. You can even use this trick with the Hey Siri voice activation feature, making it one of the better accessibility features available in iOS. Have any other screen speaking tips or ideas for how to use this great tip? Let us know in the comments. Thanks for the tip! This will help my wife. I followed the instructions and had Siri start reading a certain website (using Safari). I wanted the home page main text, but it was reading the whole menu of the site. I couldn’t stop it. Even after I closed out the website, the reading continued. I did not see any onscreen controls, and couldn’t access them (tried swiping up). Finally, I succeeded in saying Siri stop reading, and it stopped. This experience was promising, yet scary. 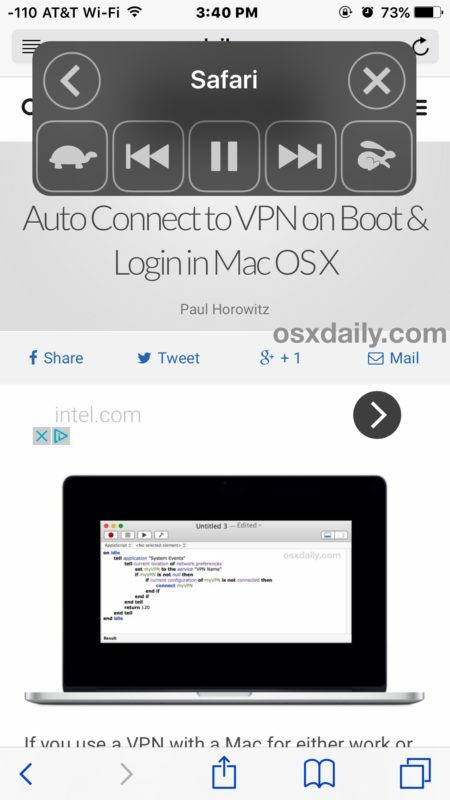 To get even more-use reader view, to avoid add reading by siri!! Once you turn on this feature, you can also highlight a paragraph or sentence and in the black overlay menu that appears you can choose to speak only the selected text instead of the entire page. Also, for web pages, I highly recommend putting it into the streamlined “Reader View” before using the speak screen feature so that the function doesn’t read a bunch of random stuff on the webpage that doesn’t pertain to the article. I find in order to make this feature reach a page in German, I have to set the ios default language to German too, or else the page read in English AND only English dialect options appear under “default dialect”. Yet, when reading a German page sprinkled with a few lines of French, Siri is “smart” enough to switch from the German “Anna” voice to a male French voice, which seems to suggest Siri could detect languages and switch the voice on-the-fly. BTW, the “speak screen” command in German is “bildschirmhalt sprechen”. The puzzle is, is it possible to keep the system language in English and still have Siri speak text in the correct language dialect. The autoswitching between German and French voices suggests iOS could, but I haven’t found how to configure it. Once you have enabled ‘speak screen’ you can also summon it from a gesture: just swipe down from the top with two fingers. I use it the whole time as I am vision impaired and off and want to read articles on my iPhone. When upgrading devices/ios this function no longer has the ability to differentiate between languages. I am also visually impaired and have used this function on my ipad/phone for 2 years. Since upgrading software and getting a new phone, it will no longer read French to me. Spent 6 hours, over several phone calls, with Apple and they were not able to fix this – also went to the Apple store. This seems to be a glitch in the current operating systems. Very sad for those who rely upon this. I have been using screen speak daily with My Kindle app for a long time. Today it quit working. It will start reading but when it turns the page it jumps to the last paragraph of the next page. I have tried several books and it is the same result. Any ideas?